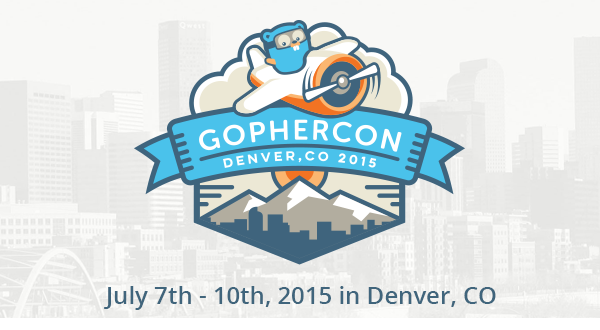 This week in Denver, Colorado myself (Adam), Jerod and DK head out to GopherCon 2015 -- the largest gathering of Go developers in the world — and we're super excited to meet all the gophers there! We're working with the GopherCon team to produce a short documentary and interviews of GopherCon 2015, so we want to meet everyone we can and get everyone on camera. If you see us, make sure you say hello! Below are some highlights of our schedule. (ht to our friends at Docker for the agenda idea). The Kickoff Party is where things begin and it's open to anyone and everyone -- you DO NOT need a GopherCon ticket to attend this event! Food and drinks will be provided so feel free to come and meet fellow gophers. The Changelog is a media sponsor of GopherCon, and we'll have a table in the large hangout area in front of the main theater where all the talks are. You should see lights and cameras. During the conference we'll be roaming in and out of the main theater getting coverage and interviews, so PLEASE take this as an open invitation to ALL that we'd love to get an interview with you. Hang out near our table, or contact us using this form to schedule some time with us. If you're a speaker reading this, we'd love get an interview with you after your talk. Head out of the theater to our table where our lights are and meet us there - use this form if you don't see us. At the official after party at Wynkoop Brewing Company we're shooting Season 3 of Beyond Code. We teased our plans for this series here and we want to get as many folks as possible interviewed. Everyone who gets on camera gets a free Changelog tee! You've heard it from Erik St. Martin and Brian Ketelsen on episode #158 and then again from Peter Bourgon on episode #163 that the Hack Day is the day everyone is looking forward to! This is the day that everyone breaks up into groups to hack on their favorite things in Go and its ecosystem. We'll still have our home base table from the two days before hand, but we'll also be all around the rooms talking to folks and getting footage of everything happening. We'll also be covering the lighting talks and side interviews with folks, so come and say hi if you'd like to talk.